Somewhere between a computer screen saver, a journey to find your spirit animal, and a car window streaked with rain, you'll find Chris Trueman's electric abstract canvases. The enchanting works, made from acrylic and acrylic spray paint, combine various threads of abstraction for a unique experience that combines the historical debates of painting with a fast-paced sharpness perfect for the short attention span of the internet generation. Combining soft and hard strokes with warm and cool colors, Trueman creates multilayered works thick with contradiction and complexity. We reached out to the California painter to learn more about his upcoming exhibition, "Beneath the Skin." Your artistic style features a visual collision of competing schools of abstraction, from AbEx to Op Art. How would you define your style without reference to these other modes? My artistic style is about constructing something new out of the parts and pieces of systems and modes that at one point were ideologically isolated philosophies. The reason I have currently gravitated to Ab-ex and OP wasn't because of their place in art historical context, but because the experience of them was so opposing. Ab-ex was a sort of transmission, a nonverbal message through the paint itself, and OP was so much more of a reflection about the body of the viewer and how experiencing OP art made you realize that your perceived world wasn't as stable as it seemed. Perception depends on things staying still. By combining these modes you get a transmission lost in the reflection or a persistent presence in your otherwise pleasurable visual stimulus. I make paintings based on the premise that the sum of two contradicting experiences does not cancel out but creates a whole separate experience unto itself. There are a number of other references in the work such as graffiti, street art, computer graphics, 3D modeling, fashion and also various types of space -- illusionistic space, a flattened "abstract" space, space based on series of overlapping layers that act like a screen or photoshop space, physical and textural space. I'm mining the history of painting and visual culture to take advantage of what these diverse modes and processes can do and what the experience of them is. Walk us through your process. How do you begin a work and how do you know when it is finished? My process begins on a raw canvas, I start by painting gesturally, with brushes, squeegees, and a variety of tools. The second layer is often a process of masking and spraying with an acrylic based spray paint. In this process I have to start building backwards, because the negative space is what will show through. Sometimes the spray is solid, at other times it allows the previous layer to show through, sometimes the masked layer covers the whole surface, sometimes just parts of the painting. The interesting thing about using the acrylic spray paint is that it adheres differently to the various surfaces, so the areas with the underlying gesture the spray is more solid, whereas the areas of raw canvas, the paint doesn't adhere as well. This ends up merging the layers, rather than a flat even graphic layer on top of a gestural painting, the graphic layer takes on the shapes and forms of the underlying layers. I then repeat this back and forth, more gestural painting, sometimes staining by watering down the acrylic paint and then back to the masking and spraying. What makes this body of work different than the previous bodies of work is that the gesture comes back to the top, before the final layer was a masked and sprayed layer. I know it is finished when there is a tension and balance between the forms, even though I work somewhat intuitively in the process, I start out with an idea of what the work will more or less look and act like in the end and I can see when I have accomplished my objectives while maintaining a freshness. How, if at all, has California contributed to your aesthetic?I think California has been a big influence -- the color, the light, the amazing history we have here have all contributed in some way to my paintings. I also like it when there is a sense of place that comes through in the work. You can see a Berlin aesthetic in work coming from Berlin and it is tied to the ideas that are circulating. The same happens here, there is a youthfulness and a boldness that I see in a lot of LA-based work. I also think that Hollywood and the movie industry can play a role in the work that is made here, a cinematic quality. What's your biggest distraction from working?I am very fortunate to not have too many distractions from working. My wife is very supportive, we have a 16-month-old daughter Luca that I love to spend my time with and I teach at Fullerton College and Santa Ana College a few days a week, but I wouldn't call either of these a distraction. I love spending time with my family and I get a lot out of teaching, it keeps me sharp, on my toes and thinking about why I make the decisions I make in own artwork. Nothing makes you think about your process and ideas more than having to explain it to a student. I have a really dedicated studio practice and get into the studio at least five days a week. I have also been traveling quite a bit for art fairs and shows, I think the travel is probably what pulls me out of the studio the most but it is so important to me to see what else is going on out there and I enjoy showing my work actively. 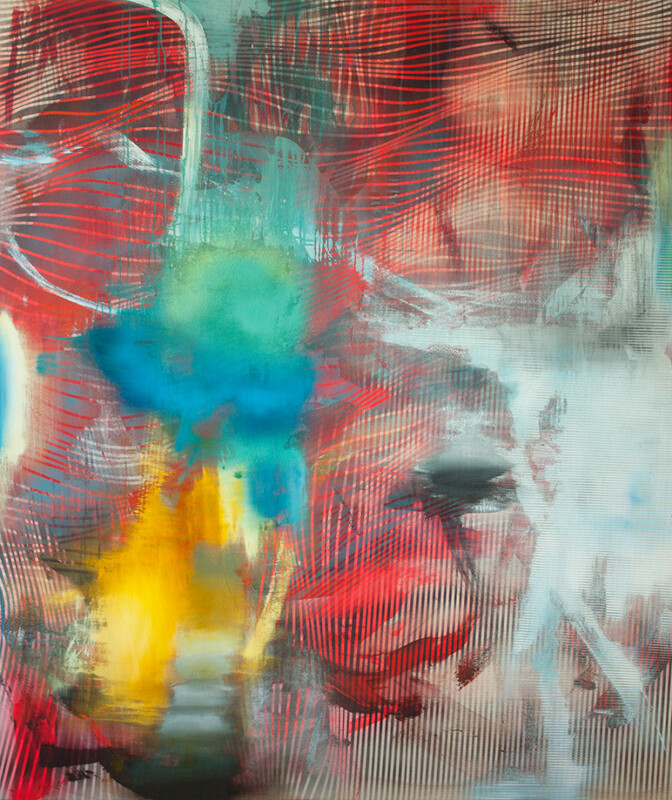 Chris Trueman's "Beneath the Skin" will run until April 26, 2014 at Edward Cella Gallery in Los Angeles.